Looking for the faces of our ancestors Jump to media player Today we can all look online to find out who our ancestors were, and soon geneticists hope that DNA can show us their faces as well. The headband that measures boredom Jump to media player Researchers have developed a brain sensor that will help computers interact directly with people. Rajini Vaidyanathan put it to the test. Today we can all look online to find out who our ancestors were, and soon geneticists hope that DNA can show us their faces as well. Mark Shriver, Professor of Anthropology and Genetics at Pennsylvania State University, and Peter Claes, from the University of Leuven in Belgium, have been working for four years on the genetics of facial features, meaning the relation between genetic sequences, facial traits and skin tones. They have enough data to be able to reconstruct a grandmother's DNA and an estimate of her face based on her grandchildren's genotype. Prof Shriver is confident that in two years the idea of seeing the faces of our great-great-grandfathers will no longer be science fiction. 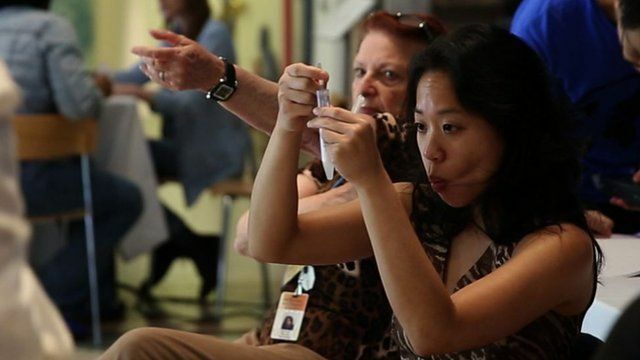 The BBC filmed as Prof Shriver tested the genes of volunteers at the New York Historical Society during the World Science Festival to see how genealogy, the second favourite hobby of Americans, is evolving.